Over the years, all sort of interesting sites have turned up in my inbox from correspondents seeking my opinion on what they have found. 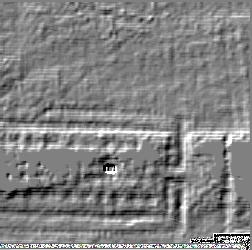 This has included a potential biblical site in the Sinai Desert that I subsequently identified as the archaeological impression a SAM missile battery, however, by far the most exciting structure arrived in the form of a resistivity survey image that I received from Ireland. It arrived without any detailed context information or identification; this is perfect – the biggest problem in this type of analysis is observer bias, so the less I know the better; all that matters is the data provided, in this case a survey. 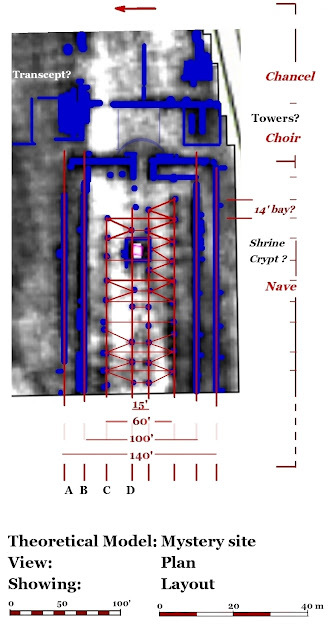 Unfortunately, I get involved in this type of type of thing because I specialise in engineered structures, so like many archaeologists looking at this type of image I have a first impression. This initial bias, which equally might also be regarded as skill or expertise, can only be mediated by adherence to some form of deductive methodology. Just like a police enquiry, there may be a prime suspect, but it still important to eliminate other potential suspects; if you are going to allege that this is the remains of one of largest ancient structures ever built in Ireland, you better have a watertight case. Notwithstanding some minor edits to text and improvement to the layout of illustrations, the following is the case as I presented it. As this site and its context are unknown, this is certainly not a conventional report, simply a list of observations which together form the basis of my analysis. It concentrates on scale, which in architecture, is related to technology and hence to period. My approach is drew up a rough model plan of the principle features, which is then measured and considered in terms of its structural geometry. The relationship between the features being indicative of an architectural scheme, which represents a particular approach to the engineering of roofed space. Having identified the most likely type of structure, there was little point in going beyond this, since others are better positioned to do this without speculation. On the basis of the resistivity image supplied with no other contextual information, and having initially identified the principle components as a basic model, [above], I would make the observations that follow. As the figure [below] illustrates, Early Neolithic domestic and farm buildings are relatively small roofs around 25’ wide, by the later Neolithic / Early Bronze Age 50-60’ spans could be achieved, and were used in conjunction to create larger roofed spaces, which were usually circular, and did not use load baring walls. A typical Prehistoric roof foundations have about 1 post per 10m², a structure this size would require something like 300 -400 postholes. In addition Prehistoric roofs tended to be supported at the apex. It is much larger than medieval English timber barns like Cressing Temple – built at the scale limit of that technology. 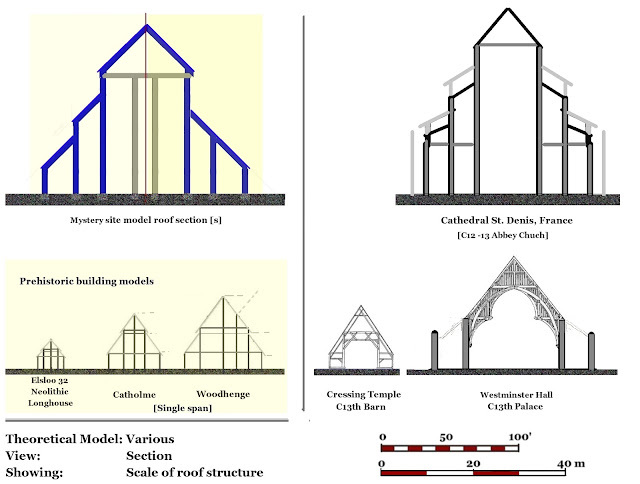 The width of the roof is close to the technological limit for timber roofs with stone foundations, Westminster Hall being the largest known historically. The width of the structure suggests a building with stone foundations, [which have been robbed]. High status royal or aristocratic architecture would be fortified or enclosed in most periods. In the context of Ireland, only in the Christian Period do we see building on this scale, where it is part of European architectural tradition of ailed stone structures. [Cathedral St Denis, France is a random example with double aisle of similar scale]. Within a monastic or ecclesiastic context, industrial and agricultural buildings although substantive were small in scale, only the places of worship were were this size. Alignment; the structure is aligned E-W which is more typical of Christian and later eras than in Prehistoric periods. The construction of building on this scale may have several phases of development and adaption. The layout and spacing of components is generally appropriate for an ailed building; a double aisle A & B, with C as the Nave; [D is problematic]. The large anomaly in the centre of the structure is probably best understood as crypt. The structure appears continues to the east beyond the transverse wall with an “entrance” at the end of the nave into what should be a Choir / Chancel. 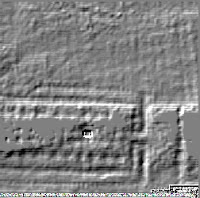 This is an important and diagnostic area of this type of building, being the location of a crossing in a cruciform plan, and a place for a tower for example; it is not clear what is going, but some substantive structures are indicated, perhaps towers. The lack of any obvious major structures to the North is typical of a church within a monastic built environment. 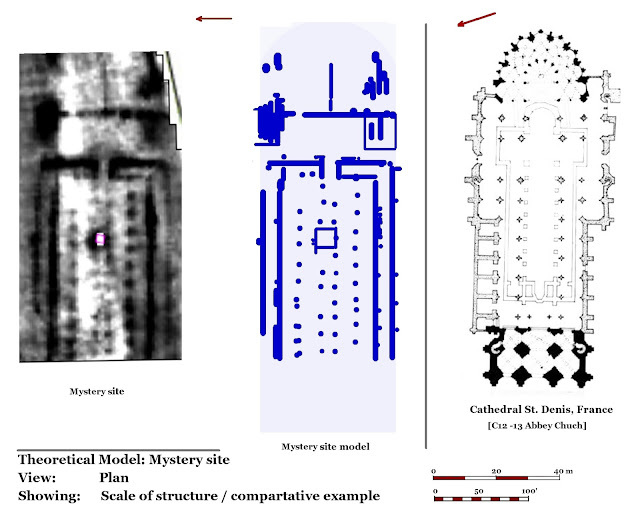 The lack of evidence for a crossing / North transept indicative of a cruciform plan is surprising. However, and this is important - if you seek you tend to find – so it is possible a case can be made, but I did not notice any extention to the North when I drew my initial plan. Measurements; while it is difficult to be concise with the data provided at this scale, the structure is clearly proportionate and symmetrical. It can be understood as laid out in feet/ cubits; the nave 60‘ wide, with 14’ bay/ pillar spacing, having two pairs 20’ “aisles”; 140’ wide in total, suggesting a building originally about 420’ long. • Underfloor features related to a under croft / crypt. 2. Since the configuration East of the Nave is unclear is difficult to understand the architectural style of the building as a whole. The scale, layout and implied engineering technology preclude it being a prehistoric structure. The only reasonable archaeological context is a robbed stone built Christian place of worship. The plan appears to be a fairly basic basilica / Romanesque plan, substantial but fairly plain; which might suggest Pre-Norman date. In addition. . . . I might surmise that the presence of this type of structure was not suspected, and thus the site is not well documented which may suggest an early dissolution. The Scale of the structure suggests a significant, perhaps royal endowment or patronage. 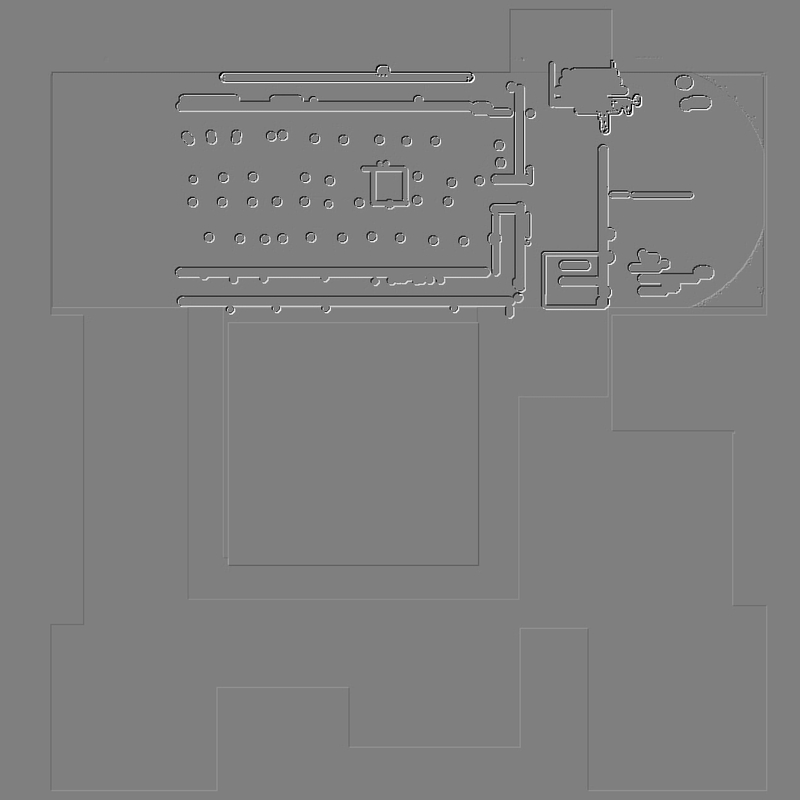 A crypt in the centre may indicate an association with relics / pilgrimage / saints. A significant volume of stone has gone somewhere locally after its dissolution, and may have reemerged as a castle or religious institution nearby. Therefore, since the location is known, it will be fairly straightforward to give this site an historical context. While it is far from easy, it is important to maintain an open mind during any process of structural analysis, where observer bias may lead to looking only for those things that confirm any initial impression or theory. Archaeology requires a high degree of self-awareness and vigilance when it comes to reasoning, however, an understanding of which types of observation are technically significant can produce a degree of certainty with some types of data. 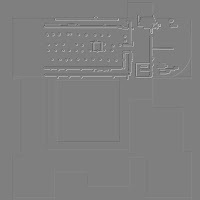 In this case, once you can demonstrate from its geometry that this was a roofed structure, then in terms of the spaces defined by the parallel lines of features, scale is the key determinant in defining what type of engineering is represented in the below ground archaeology. As far as I can see, what we have here is probably one of the largest Christian buildings ever built in Ireland, the precise location of which was previously unknown. Any religious foundation on this scale is likely to be known of historically, but like many such buildings, their dissolution and recycling was so thorough, that they have become forgotten, "lost", probably much as intended by the new order which replaced them. 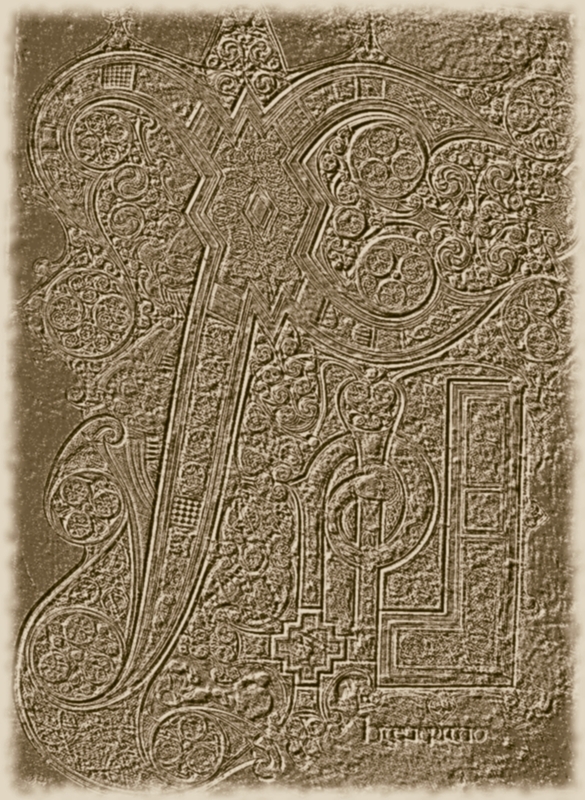 While its location is not known to me, I do have do have a shrewd idea where it is, which only adds to my conviction that this will prove to be a very significant discovery for the archaeology of the early Church in Ireland. More information on Cathedral St Denis in northern Paris, a singly important Church and French royal burial site, is available here.